This has become one of my favorite side dishes. I know quite a few people who are not a fan of the brussel sprout, but I personally am! Actually, let me clarify that...I'm a fan when they're prepared like this. If you boil a brussel sprout and serve it to me, I most likely won't eat it. But, when they're roasted and seasoned like this recipe calls for, they are so so SO good! I swear. And I wouldn't steer you wrong. 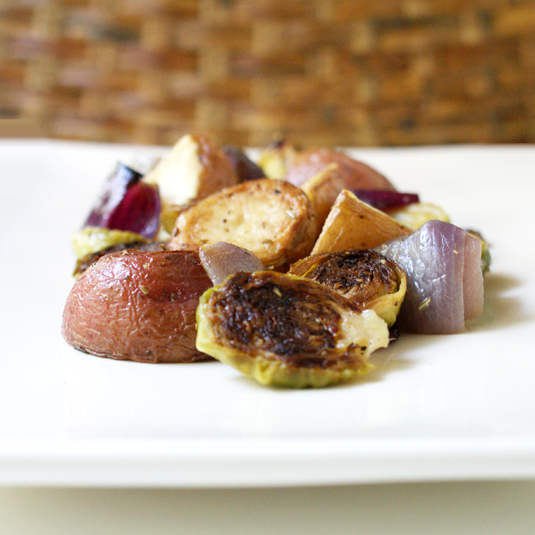 So, for all the brussel sprout haters out there, I suggest you give them another try. Just do it! They're healthy, delicious and super easy to prepare. Throw in the potatoes and onions and you've got perfection on a plate! What have you got to lose? Wash brussel sprouts and peel off any loose outer leaves. Cut off the stems, but not too much so all of the leaves fall off. Cut each on in half lengthwise. Wash the potatoes and cut each in half. If you have really large potatoes, you may have to cut them in quarters. They should end up being about 1 to 1¼ inches in diameter after they're cut. Cut the red onion into approximately 1 inch pieces. 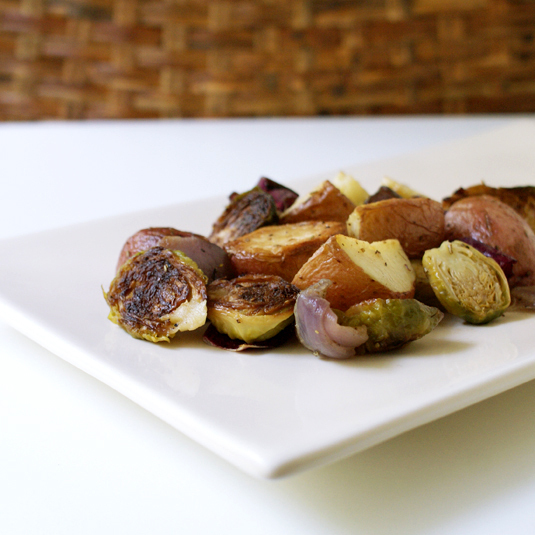 Place the cut brussel sprouts, red potatoes and red onions into a large bowl. Toss with olive oil, rosemary, thyme, salt and pepper until thoroughly coated. Spread the bowl contents out in a single layer onto a baking sheet lined with aluminum foil. I use non-stick foil, so no greasing is required If you're using regular foil you'll want to spray it lightly with cooking spray. Make sure that most of your potatoes are cut side down so they brown up nicely. Drizzle with a little extra olive oil so everything's good and juicy. Roast for 15 minutes. Remove from oven and stir around with a spatula. If you see any loose leaves from the brussel sprouts that have become very brown, you can pick them out. (They're my favorite little thing to snack on! Crispy and delish!) Return to the oven and roast for another 10 minutes or until the potatoes are cooked through. Garnish with a little sour cream if desired and dig in! Small pieces of carrots are a yummy addition. My family loves when I make this! Thanks for the recipe!